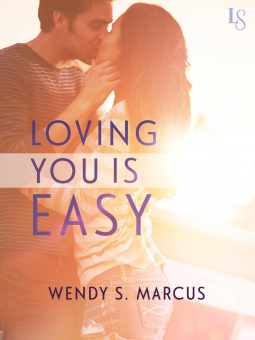 Loving You Is Easy by Wendy S. Marcus attracted me because of the intriguing title and blurb. Hoping for a light, quick and entertaining romance, I picked this book up to read and wasn't disappointed. The story starts with the protagonists getting to know each other through letters which was kind of sweet. But I felt this sweet phase was too short and left me wanting more. The story is overall a sweet love saga that had plenty of drama and had me entertained throughout. The only thing I didn't buy was the insta-love between the protagonists. One moment they were pen pals and the next they were full fledged lovers which seemed odd. I would have loved to see gradual development in their relationship. The author's writing style is expressive and fluid. In this book, she gives us plenty of melodrama that would have looked over the top but she quickly and expertly wraps it so it doesn't look unrealistic and I could digest the scenarios. I enjoyed her style and look forward to reading more from her in the future. A light, breezy romance perfect for a lazy afternoon, I give Loving You Is Easy by Wendy S. Marcus 3.5 out of 5 and recommend it to romance lovers.